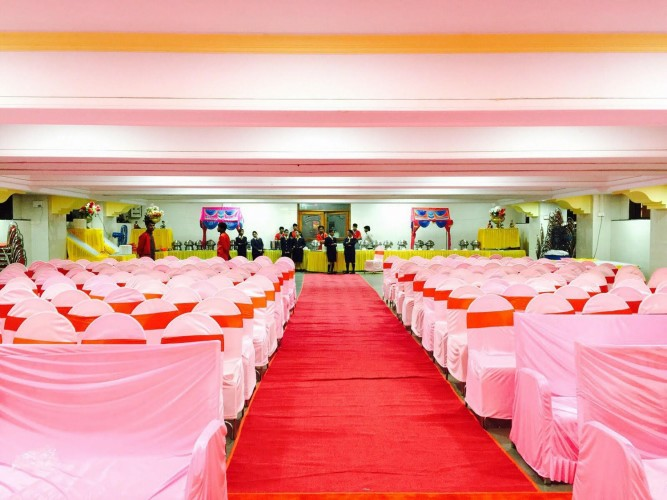 Whether you are planning to have an intimate wedding or an exorbitant one, Saraswati Hall will surely match your unique choice, budget, and requirements. With a capacity of accommodating up to 500 in seating and 750 in floating, the venue has a cosy and comfortable interior for the guests. It also offers an in-house team of caterers that puts all the efforts to delight the guests with mouth watering multi-cuisine dishes. Popular amongst localities Saraswati Hall, Matunga, Mumbai, offers multiple places for your pre-wedding and wedding ceremonies. You can choose elegant hall for your pre-wedding as well intimate wedding functions or lush green ground under open sky for a grand wedding reception. The venue offers all your event services with professionally trained team of decorators and caterers who will ensure a lively and happy to go event. Venue does not allow outside caterers. Venue does not allow outside decorators. In-house catering and decor provided by Mayur Caterers. Venue does not allow DJ. Venue does not allows alcohol. Venue is available in the following time slots: 8:00 a.m. - 03:00 p.m. (Morning) 4:30 p.m. - 10.00 p.m.(Evening) Two complimentary changing rooms are provided to the bride and groom. Hotels available around the venue for accommodation of outstation guests: Hotel City Point (1km from venue): 30 rooms, average price double occupancy is Rs. 4,000 + taxes. These are average rates and are subject to change. Venue has open road parking facility outside the premises. Popular amongst localities Saraswati Hall, Matunga, Mumbai has a banquet hall and a lawn for your wedding and reception party. You can choose the elegant banquet hall for your wedding functions and the lush green ground under the open sky for a grand wedding reception. Saraswati Mandir Hall Mahim serves delicious pure vegetarian food for the guests to gorge on. The venue offers all your event services with a professionally trained team of decorators and caterers who will ensure a lively and happy to go event. Saraswati Hall has two-time slots you can choose the one which suits you the best. The venue is located at a close distance from Mahim Station and Al Samit International which makes it easily accessible for all. Saraswati Hall, Matunga, Mumbai offers ample car parking space to their guests for their convenience.